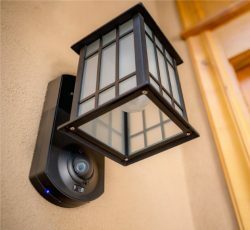 Most people have the notion that it’s best to have security cameras inside the home, but neglect placing security cameras outside of their home. Placing security cameras outside of your home helps prevent the crooks from coming into your house. You wouldn’t want your security camera system to work only when the crook is already in the house. It’s actually a good idea to have video surveillance both indoors and outdoors. 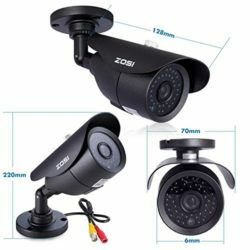 If you’re looking for outdoor security cameras then consider the options below which you can find on Amazon.com right now at great prices. This SOZI camera is truly a high-performance camera at a very reasonable price. It is equipped with 42 infrared LEDs lights, which will activate when it is dark or there’s low light. The night vision displays in black and white with a reach of up to 120 feet. The video resolution is very high at 960H 1000TVL and comes with sensors to provide clear images, even in the dark. 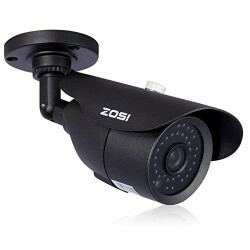 The camera uses high-quality metal materials, which can effectively prevent rust. It can also be installed anywhere outdoors or indoors. High Definition video both day and night. A security camera friendly display if you want to just display the video only. If you want to record the video also, you will need a Security DVR such as this one. A video surveillance extension cord and a power extension cord if you want to place the camera more than 1 foot from your DVR. A BNC to RCA adapter if your display does not accept a BNC input (eg: a TV). If you are looking more for dome type of cameras this one might just be the right one for you. The camera produces an amazing 1000 TV lines of resolution for superior image quality. If you need a wide viewing area this camera provides a 2.8-12mm varifocal lens to help get the best wide viewing angle possible. The Auto Gain Control (AGC) and Back Light Compensation (BLC) help optimize the picture quality in any given lighting condition. Night vision is no problem because of its IR range of 98ft for high-performance video even in complete darkness. The weather and vandal resistant housing help this camera withstand even the toughest of outdoor conditions. 1000 TV lines of resolution for superior image quality. IR range of 98ft for high-performance video in complete darkness. Don’t let the price keep you back from checking this camera out. With an ultra modern look and capabilities, this little baby here is it if you are looking for a wireless option. The Arlo camera lets you see videos in stunning clarity and sharper details in high definition. 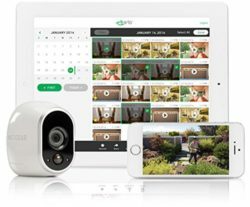 The system lets you watch live streamed or recorded videos from your computer, smartphone or tablet using Arlo’s free App. 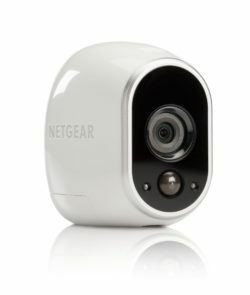 The Patented 100% wire-free design and magnetic mounts let you discreetly place the camera/s where you want and monitor your home from any angle you need it at. The camera also delivers night vision capabilities with HD clarity no matter how dark it is. One of the best features of this little camera is its motion activation setting. When this feature is triggered by motion the system will provide customizable activity alerts in real-time through email or app notifications. This camera is weather resistant so it can be used for both indoors and outdoors. 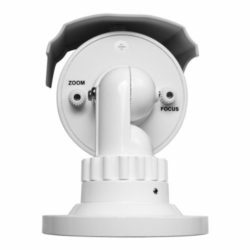 The camera is built for an easy and quick installation. Sometimes good things don’t always have to come from the big name brands only. 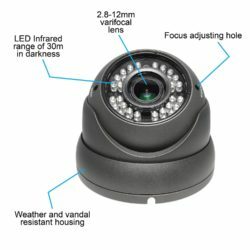 Best Vision Systems have entered the market with their line of security products and have definitely hit it out of the ballpark with this little camera. The camera comes with an incredible 1/3″ 1000 TVL image sensor that will produce true HD analog video no matter where you place it. The 2.8-12mm lens gives you the ability to have a wider and larger viewing area. Its night vision capabilities are beyond the scope of many cameras on the market today. 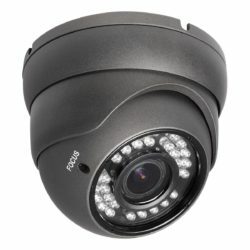 It provides 164ft IR range with superior video quality in complete darkness. This is one of the highest ranges from a night vision home security camera that we have seen so far. The camera features an outdoor IP66 housing made to withstand even the toughest weather conditions. It is also Back Light Compensation (BNC) equipped which helps to provide optimal picture quality in any given lighting condition. Meet the next generation in Home Security and Burglary Prevention: The KUNA Smart Wi-Fi Security Camera, Intercom, and Light. Not only is it a unique idea, but an idea that just plain works as well. 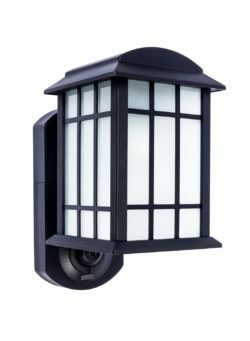 This beautiful outdoor metal and glass wall lantern comes stocked with a 720P HD Video Camera as well as Smart Technology to live stream video from your home to your mobile device. The camera allows you to receive real-time notifications when someone is detected at your door and when motion is detected, push notifications are sent via the Kuna mobile app to your mobile device. Not only are you able to see who’s at your door, but you can communicate with them via its live Intercom 2 way voice feature which is a total game changer. You can speak live or send pre-recorded voice messages via your smartphone. You can deter burglars with its built-in alarm with just one push of a button. KUNA supports iOS and Android devices in order to help you get the most out of these remote features. With so many great options on the market today in security video cameras it can be tough to decide, but hopefully, this guide will narrow it down to 5 of the top ones right now. 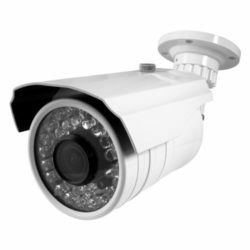 If we had to choose one out of the five we recommend the Best Vision BV-IR140-HD 1000TVL Bullet Security Camera mainly for its incredible technical specs, reliability, and of course price. For more information on security cameras click here.